A man holds a full-sleeve shirt. In the background a small open package is seen. Man: ...a full-sleeve shirt with a weird Apache feather on it. In the next panel a woman is seen examining the full-sleeve shirt. She is extracting a soft shapeless object, which could be another item of clothing, from the neck hole of the full-sleeve shirt. Woman: Wait, look! 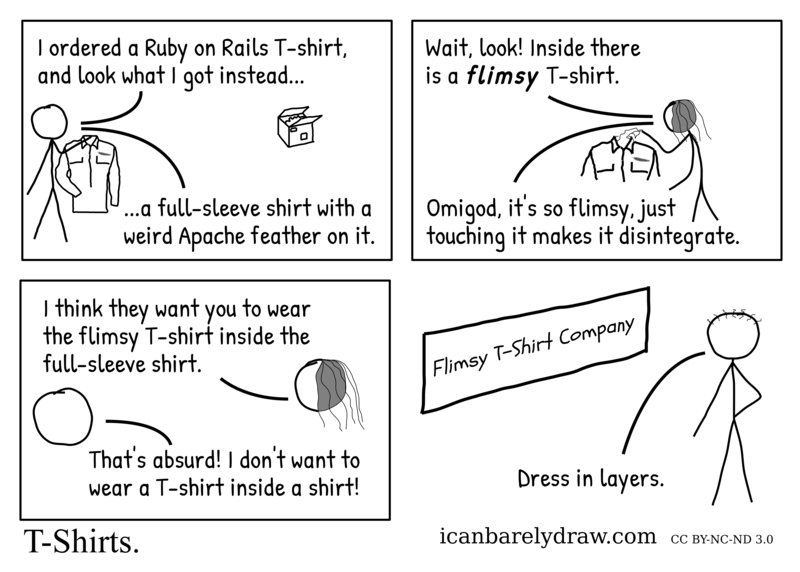 Inside there is a flimsy T-shirt. Woman: Omigod, it's so flimsy, just touching it makes it disintegrate. In the next panel the man and the woman are engaged in conversation. Woman: I think they want you to wear the flimsy T-shirt inside the full-sleeve shirt. Man: That's absurd! I don't want to wear a T-shirt inside a shirt! The fourth and last panel shows a different scene. A sign reads: Flimsy T-Shirt Company. A different man stands with one hand on his waist and the other extended downwards. Different man: Dress in layers.